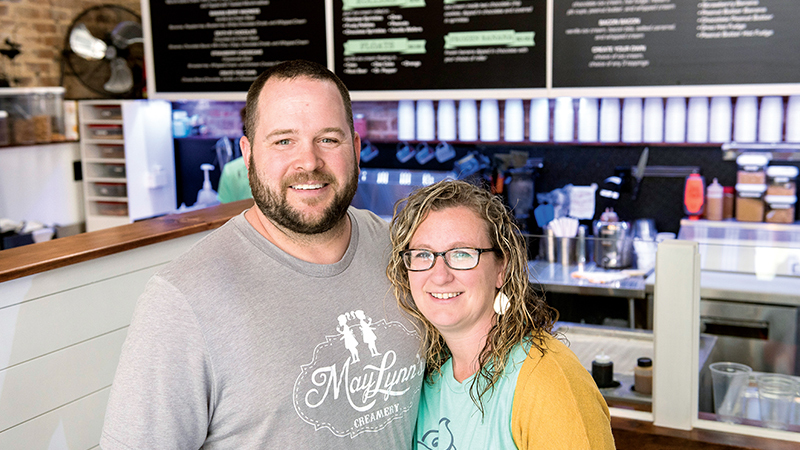 Heart and hustle: two qualities that define Josh Kirk, owner of MayLynn’s Creamery and the newly opened MayLynn’s Downtown. After a devastating accident six years ago, Kirk found himself literally starting from scratch. Looking back now—with two successful shops open and sister company Chill City Pops launching—he says, “Don’t get into [a business] unless you’re willing to put the time in.” And judging from his schedule—14-hour days, 7 days a week—it’s a lot of time. “You have to be willing to sacrifice what’s needed to make it great,” he says. For Kirk, the motivation came as a result of some life-altering circumstances. At the time, doctors told him he may not walk again, but either way, he was never returning to manual labor. Recovery meant two things: bed rest for almost five months and a huge question mark as to a future career. But after some time, Kirk says, the idea actually started to make a whole lot of sense. “I’m a lover of food, period,” he says. “And I love the restaurant industry,” noting his younger years spent as a server for local restaurants. He took advantage of all the time he had, researching for hours on end; he detailed out what he would need in terms of inventory, overhead, and machinery. He listed the pros and the cons; he prayed about it. “I looked at every in and out of this business and learned as much as I could,” he says. 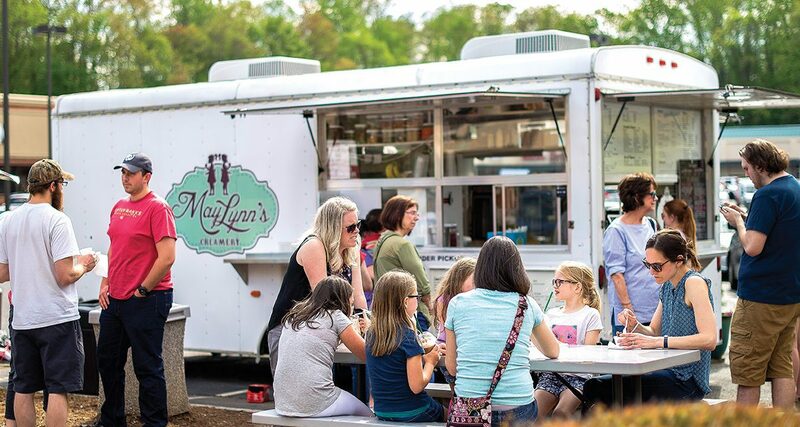 Then, he put together a business plan, and after procuring the funds, a trailer, and a location very quickly, MayLynn’s was in business, a mere seven months from his fall. The reception upon opening was “absolutely amazing,” he recounts, saying the Boonsboro community fully embraced their first trailer; and within two and a half years, they had paid back the initial loan in full. Now, at the start of their sixth season, Kirk is still plowing ahead. 2018 quickly kicked into high gear when the opportunity to purchase the Jefferson Street shop unexpectedly arrived at the end of 2017. Kirk knew it was a good move and went ahead, preparing the shop to open for the spring season. All this despite his pre-scheduled reconstructive ankle surgery that occurred on January 5 and the year-in-the-making development and launch of Chill City Pops, a sister company he started with business partner Blake Gerderberg, that serves all natural, locally sourced ice pops. Kirk stays afloat with the continued help of his wife Becky, who homeschools their four daughters (each represented in the downtown shop logo silhouettes) and also does the bookkeeping, scheduling, and administrative tasks. Becky’s dad is their accountant; Kirk’s mom is an errand-runner, ice cream server, and all around support. To say it’s a family affair would be an understatement. Plus, the name itself, MayLynn’s, is a composite of the middle names of Kirk’s two oldest daughters. Not a single element is beyond his purview, whether one looks at the logos that he helped design, or the storage cabinets he built himself to be hidden behind the mounted display menus—an idea he adapted from a coffee shop. “I moved the register over here,” he says gesturing, “And I moved the order spot here.” Not one to be slowed down by a boot (the result of that January ankle surgery), Kirk custom-built and re-designed the majority of the downtown storefront, outfitting it to suit the best practices he’s developed over the years. While his earlier career in construction work gave him an advantage on the renovations, Kirk has an equal fascination and dedication to menu and flavor development. Kirk also sells Sluggo’s homemade, hand-dipped ice cream direct from Madison Heights. “Sluggo’s is an amazing product,” he says. “And they are amazing people.” They even worked with Kirk to develop “Blue Moon,” a favorite ice cream from his childhood days spent in Michigan, with a flavor profile of blue raspberry, lemon, and vanilla. Now, only a few weeks into the current season and with the new downtown shop up and running, Kirk says they’ve already had a Saturday with lines out the door for hours on end.